The main problem with fragile things: they're fragile. They can crack, chip, smash, shatter, or downright disintegrate if they’re not given the right amount of care. Even when packed properly in a long term storage unit, things can shift and move when left to their own devices. Really, truly, properly packing fragile things for long term storage involves being overly prepared. 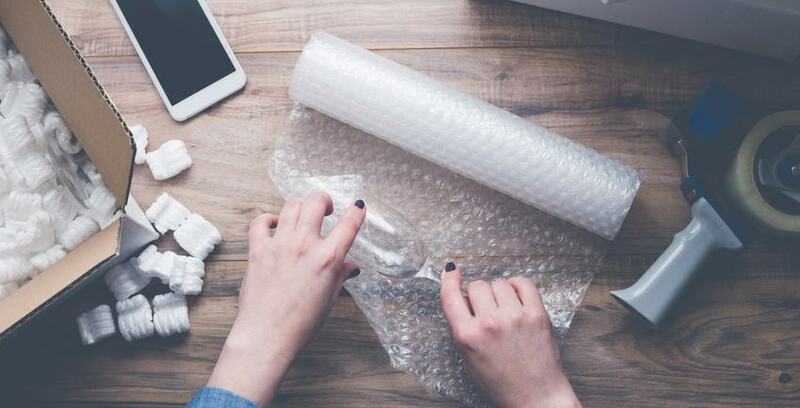 Supplies you should have on-hand when packing fragile material include: boxes of various shapes and sizes, bubble wrap, tape, packing peanuts, packing paper, markers, and dish dividers. In fact, many places offer boxes that include build-in divisions for specific fragile things like glasses or dishes. You want to have options to handle fragile materials of different shapes, sizes, and weights so that you don’t have to interrupt your packing process to go buy new things (and lose your precious momentum). Of all the directions in the list, this one is the one we consider to be the most important and least frequently considered. When it comes to storing fragile items we recommend two things most of all: smaller containers and plastic containers. Plastic boxes are more rigid which means that they won’t get soft over time like cardboard ones can. Additionally, with all the extra padding and packaging, the weight of oxes can add up fast if the box itself is too big. Trust us when we say there are few things as devastating as dropping a full box of fragile items just after you spent two hours packing it. Take the time to wrap each piece individually. If you're prone to boredom, throw some music or a podcast on to help pass the time. You'll be grateful that items were safer from the individual wrapping later in. To wrap your fragile stuff, first place it upright on top of a sheet of packing paper. Crumple additional paper inside of the item if you can. Then, wrap the outside with paper and bubble wrap. Finally, secure it all with packing tape. We can’t emphasize this point enough, especially if you’re using cardboard boxes: tape up the bottom of your boxes. Tape them up a lot. Tape over the bottom in different directions as much as you think you should. Then do it some more. You don’t want that bottom falling out with all your valuable breakables inside, trust us. Your cousin Richard is a really nice guy, but he isn’t as worried about your fragile stuff as you are. If you really want keep your fragile stuff safe, we recommend moving them on your own - or only with the help of people you really trust. A dropped box can be more than a few broken dishes; it can give you a broken heart. We don’t want you feeling that way. Keeping these tips in mind will help you keep your fragile items safe and secure when placed into long-term storage. If you’re looking for a place to keep your fragile items especially safe thanks to advanced security and temperature-controlled storage unit options, don’t forget to consider the many options offered by Storage Direct.